On Friday, October 6th, 2017, the Star City Bulldogs defeated the Hamburg Lions with a final score of 28-27. The first quarter was slow as neither team scored. The second quarter was slow for Hamburg but for Star City it was the best football they’ve played all year. The Bulldogs scored early in the 2nd making the score 7-0. The Bulldogs quickly scored again, setting the score at 14-0. Hamburg found some life and answered on the next drive, 14-7. 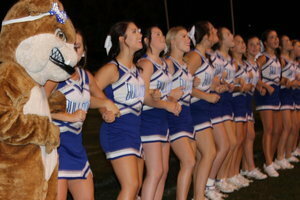 The Bulldogs weren’t done and scored late in the second quarter, making the score 21-7. The Bulldogs got the ball right back and scored again with 16 seconds left in the half, setting the score at 28-7 as the half ended. The second half was different as the momentum shifted in favor of the Lions. Hamburg scored three times in the second half while Bulldogs scored nothing. “I feel like we were fatigued in the second half” Coach Jett Furneaux said about the second half performance. The last time Hamburg scored the Dogs recovered a loose ball on the kick attempt by the Lions, preventing the extra point that would have tied the game. “The last three defensive drives were very big for us, it showed we had some fight” Coach Furneaux stated. Sam Reed finished the game with 2 touchdowns, one throwing and one carried. Reed had 150 passing yards and was 10/15 for passes. Reed had 25 carries on the night for 103 yards. Reed averaged 4.1 yards per carry. Alek Taylor had 8 carries for 27 yards and one touchdown. Taylor also had four receptions for 67 yards. Taylor averaged 3.4 yards per carry and 16.8 yards per catch. Jacob Reynolds had 3 receptions for 53 yards and Hunter Avery had 3 receptions for 30 yards and one touchdown.